Parker was one week old as of yesterday. 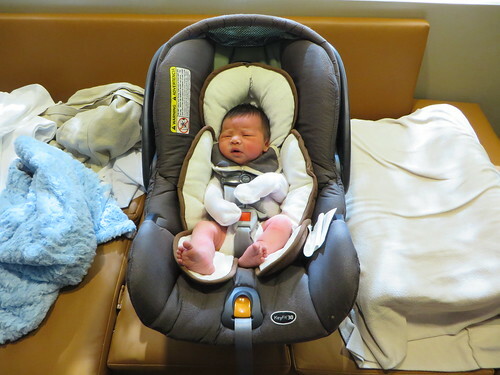 About to go home from the hospital. Waiting to see the pediatrician. "Wait a minute . . . you put me down!" Unfortunately for Parker, many of his observations are compare/contrast back to when Evie was a newborn . . . it's hard not to compare to the only other baby we've known! But I love him just the same. I'm happy that he came out healthy. I didn't have any reason to think otherwise, but even more so with Evie, I felt like I was afraid that there are so many things that could go wrong with pregnancy, the baby developing, and all that, that when he came out, there was a bit of relief that all was as expected. Right after they pulled him out, before he got handed off to the nurses for clean up and vitals and such, the doctor popped him over the drape for a second to show him to me. I admit that I got a little bit teary-eyed when I saw him for the first time. He came out with a much fuller head of hair than Evie. I joked to Greg that he came out needing a hair cut. 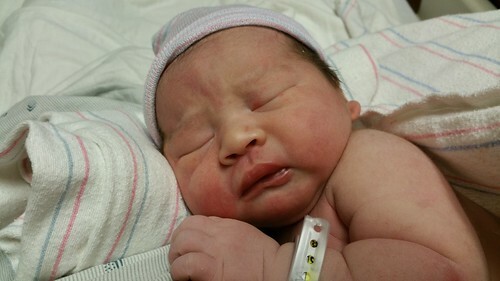 He was a little bit of a giant coming out at 9 lbs 10 oz. We had a friend who, coincidentally, ended up having her baby on the same day as we did with Parker. Her experience sounded much worse though, even compared to what happened when we had Evie. She was fully dilated and pushing for several hours before her doctor called it, because the baby wouldn't fit, and she ended up with an emergency C-section. With a baby the size of Parker, that could have very well happened to me given that this friend is also of a more petite build. Yeesh. It's hard to know beyond speculating in retrospect, but the scheduled C-section was probably a good decision in this case. 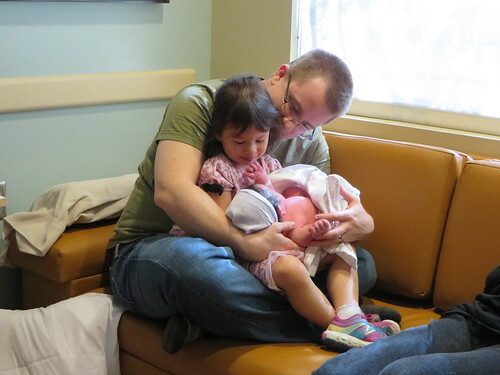 Despite Parker being a bigger baby, I'd forgotten how little they are and that Evie was once this small. So cute. And the little feet and toes? I can't stand the cuteness. Unlike Evie, he seems to be sticking more to the "all babies do is sleep, eat, and poop" type of baby that I seemed to hear about, but didn't experience as much with Evie as a newborn. Evie as a newborn wanted to be held, but it wasn't good enough just to be held while sitting, she wanted you to be moving around. Parker is content chillin' on a warm body, moving or not. 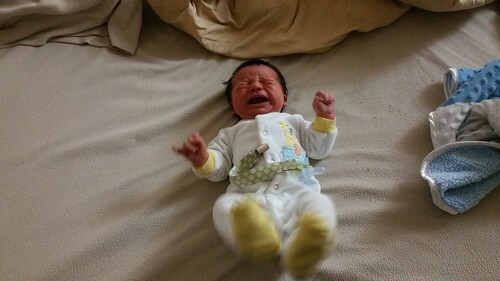 He doesn't seem to like sleeping in the crib. 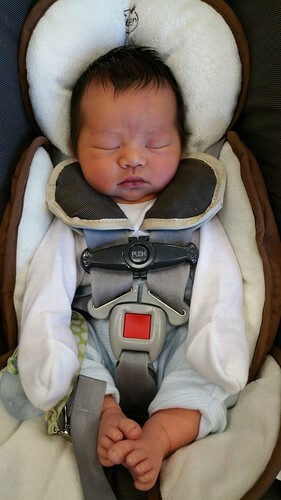 He sleeps decently in a place where he is snug (car seat, swing, bouncer), but sleeps the best when held (of course). 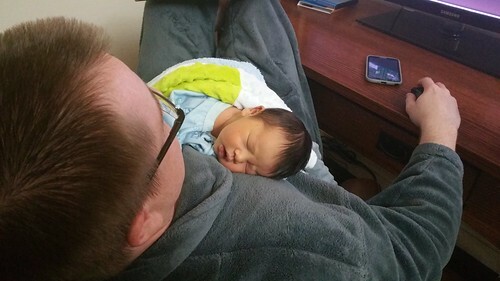 Overall, not bad at nursing (fortunately), but I feel like he has the most trouble with - or maybe is most impatient with - latching on, which then leads to being upset and fussiness (although I think even in the last couple days, it's improving). 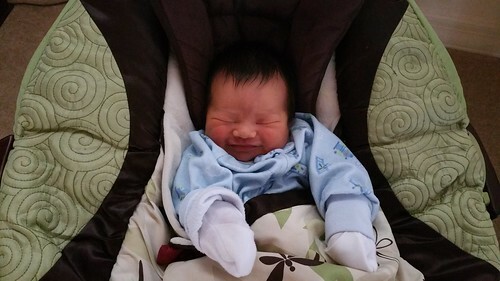 It's possible part of it is that we introduced a pacifier and also supplemented at first with formula before my milk came in, but we decided it was worth it to do both those things. Hopefully this is just a matter of him getting more used to both nursing and having a pacifier. So far, he doesn't seem to have as much of the Moro reflex as I recall Evie having. Greg says he remembers this coming on later. I remember Evie, when she was being lowered into the crib, sticking her arms straight out like she was falling, which I haven't really seen so far with Parker. I'm occasionally, fleetingly, a tiny bit sad that this is our last baby, but not sad about no more C-sections and sleep-deprived nights. 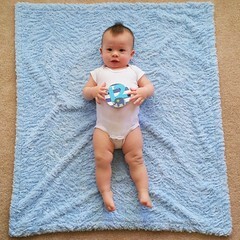 Congrats on the birth of Parker - what an adorable little dude! I was just stopping by to check if you got my postcard from Sian's swap? I don't believe I've gotten it yet, but I'm sure it's en route . . . I'll send you a note when I get it!